Ressourcement. It’s a wonderful French word meaning to return to the basics of life, to revitalise ones soul and rejuvenate the spirit. It’s what everybody needs from time to time in order to preserve their sanity in this mad, chaotic world. My prescription is for a break away to a place where you can just be and not have to do, away from the incessant chatter of voices and the drone of traffic. My prescription is for a break away to ‘la France Profonde’. Yes, there are still areas of France where the local cow population outnumbers the people and where village life continues more or less as it has done for centuries. Discover corners of France where the untainted beauty of the countryside will seep into your weary bones and revive your spirit and where the pure country air will wash away the fug of city life. The epitome of la France Profonde, this department may be the largest department in France but it is also one of the most sparsely populated. Mountains, lush meadows, deep gorges, ages old castles, unspoilt little villages, the Aveyron remains blissfully undiscovered even amongst the French. Life continues as it has done for centuries, although mechanisation in rural life has begrudgingly been given its place. Occitan, otherwise known as the ‘langue d’Oc’, the original language of the South West of France is still spoken widely in the Aveyron. Visit the 13th century old town of Villefranche de Rouergue on market day and you will hear its romantic, lyrical tones amongst the stall holders and traders. 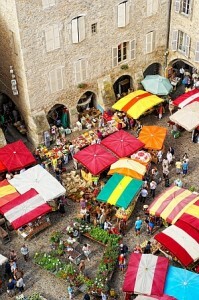 The colourful market at Villefranche. You may have heard of the beautiful handmade Laguiole knife, originally a humble farmer’s knife first created in 1829 in the village of Laguiole in the Aveyron and identified by the bee which decorates the spring plate. Visit the village, up on the spectacular and wild Aubrac Plateau and see first hand how they are made and of course purchase one to take home as a reminder of this beautiful part of France. For a full battery recharge, Andrea will take care of you. She is used to receiving weary, worldy-worn guests at her lovely boutique B&B near Villefranche. Surrounded by 2 acres of woodland and rolling countryside, peace and quiet are guaranteed in this little corner of la France Profonde. In colder months, she’ll invite you to snug up with a good book in front of the woodburner in the salon or, in the summer months, recline on a sun-lounger next to the swimming pool or in the shade of one of the big old trees in the extensive gardens. The Auvergne is number two on our away-from-it-all destinations. One of the least populated regions in the whole of Europe it has a unique landscape which is dotted with the unmistakable outlines of dormant (surprisingly not extinct!) volcanoes, all 80 of them. It is also a landscape of quaint villages and simply beautiful romanesque churches, an area of lakes and pastures and forests and is home to one of the largest protected nature reserves in Europe. 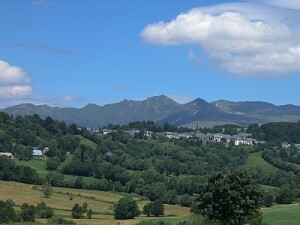 Picherande, la vallée de la Fontaine Salée and les Crêtes du Sancy in the Auvergne. Image courtesy of OT Massif du Sancy. You will find mouthwatering gastronomic delights in the Auvergne. The reputation of the beef from the grass-fed Salers herds, bred in the high pastures, rivals that of beef from the more widely available Charolais and Limousin herds. 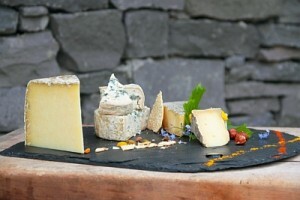 As for the cheeses, well, the range of cheese that you will find in the Auvergne is also second to none with Cantal and Bleu d’Auvergne amongst the best known. Be sure to pick some up on your lazy wander around the local market and include it in your picnic basket along with the obligatory bottle of wine. Some of the cheeses of the Auvergne. 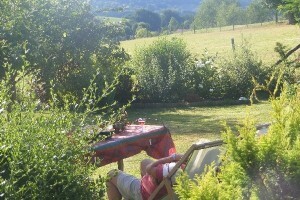 To experience the true, cathartic effect of this corner of la France Profonde, Chris will welcome you to her little bed and breakfast with stunning views across to the Sancy mountains. 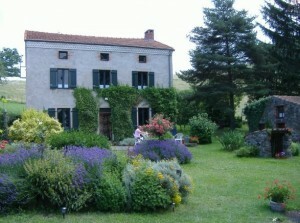 Blissfully peaceful but within easy reach of the local village with its weekly market selling local specialities, this B&B is also a nature lovers paradise. Wildflowers abound, birds of prey circle overhead and butterflies and insects busy about their daily routine. Switch off and soak it up. 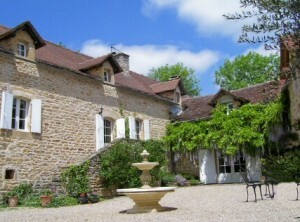 Bed and breakfast in the midst of the Auvergne countryside. Peace and quiet assured. Head deeper into the Auvergnat countryside and to the Livradois-Forez Natural Park South East of Clermont and you will be in an area of sheer, unadulterated elemental beauty, as far removed from rampant commercialism as it is possible to be. The air here is pure and guaranteed to rinse away the fug of the corporate world. This is an area of beautiful forests and rolling mountains with grazing land in between. It is only in recent years that traditional farming methods in this area have succumbed to the inevitable march of mechanisation. 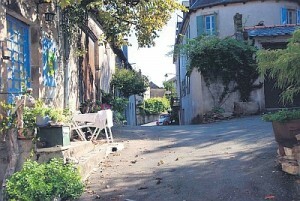 This is regional French rural life at its best. Tucked away in the countryside, sink into the cosy comfortableness of this beautifully renovated old house with its reassuring thick stone walls and heavy old beams. Home cooked evening meals, created with pride by Sylvia from organic home grown and local produce, are served in the cosy dining room or outdoors on the terrasse when weather permits. Pull up a deckchair and let the tranquillity of this place work its magic.